Staying healthy as we get older requires thoughtfulness, attention, and effort. The effects of aging can leave us more susceptible to illness or injury and can keep us from living the lives we want. That’s why maintaining positive habits such as an active lifestyle and a balanced diet are so important. It is also important to remember that our bodies are composed of intricate and interconnected systems, and problems that arise in one area can lead to or be a sign of serious health issues elsewhere. This is particularly true when it comes to our oral health. 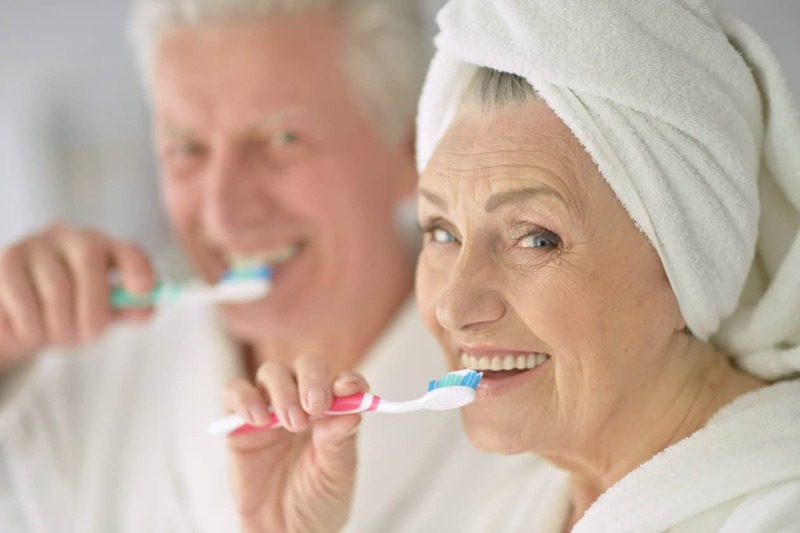 Oral health issues in seniors go far beyond losing teeth, though that is a troubling issue in and of itself as studies have suggested that tooth loss can be a strong indication of mental and physical decline in adults between 60- and 74-years-old. Additionally, the limitations on eating that often accompany tooth loss can lead seniors to avoid healthier dietary choices. Older adults need to be vigilant about the health of their teeth and gums for other reasons, each of which can interfere with the enjoyment of our golden years. Gum disease may be linked to more serious conditions. Periodontal disease can affect people at any age, but its impact can be particularly problematic for seniors. The bacterial infections which are the cause of gum disease are linked to other serious chronic conditions. For example, some studies have suggested that the risk of heart disease may be twice as great in people with chronic gum disease. You may be more susceptible to stroke if you have gum disease, as the bacteria in your mouth can increase the chances of developing blood clots which lead to stroke. Many older adults suffer from diabetes, which makes it harder for your body to ward off infection and increases the odds of gum disease. Dry mouth. Dry mouth, a condition called xerostomia, is caused by an inadequate amount of saliva. Saliva is crucial to maintaining a clean and healthy mouth as it helps to remove food particles which can lead to the growth of bacteria. Such bacteria can cause bad breath, but as discussed above, can also trigger other serious health problems as well as tooth decay which can lead to infection and tooth loss. Dry mouth is particularly problematic in seniors because it is a side effect of many common prescription and over-the-counter medications, including those for high blood pressure, depression, allergies, and pain. Many treatments for serious illnesses like cancer, such as radiation oral chemotherapy, can also cause dry mouth.